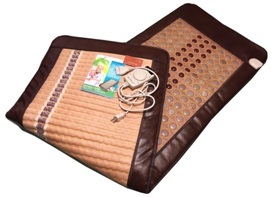 Deep comfort and relaxation are yours with the InfraMat Reverse-18JT-SideA therapy mat! One side of this mat contains jade and tourmaline stones, while the other is made up of amethyst, offering a wide variety of options for comfort and relief. Both jade and tourmaline are used to help the body fight off sickness and ill health–jade by helping prepare the body’s defenses against harmful substances and tourmaline by helping the body’s natural processes balance out effectively. Amethyst is also used to help the body energize itself and feel more active, and this comfortable mat offers usage of any and all of the three stones. The mat is a neat 180×60 cm in size, making it large enough for easy use while small enough to remain convenient for the user. With 160 watts of heating power and weighing just 8 kg, it is a solid, reassuring weight, an effective tool used to promote recharging of everything good the body has to offer. With its combination of jade and tourmaline stones on one side and amethyst stones on the other, you have the option to use and combine the traditional effects of these healing materials, ensuring you receive the most benefit possible out of your heated mat. Tourmaline is a rare stone prized for its healing properties, and with 96 individual tourmaline stones on this mat, you’re easily receiving your money’s worth! The less rare but still highly valued jade and amethyst stones are also designed to reach into your body’s energy fields and promote health and well-being. People have been using these stones to maintain and improve their lives for a very long time. Adjust the heat of this mat to your liking with its handy LED display, ensuring that your body remains comfortable while it is exposed to the traditional healing properties of the stones. Feel the combination of heat and stones boost your metabolism, increase your alertness and energy, assist in flushing out toxins from your body, and more. Join the stories of many others who value the healing combination of heat and stones. Take command of your body’s interactions with the outside world and with itself again. See why people value these comfortable, portable, and pleasant heated pads, and participate in a long tradition of using healing stones to promote the body’s own natural functions. These heating pads and mats are more than a simple tool for comfort. They are a way to help you reconnect with yourself, rediscover your body’s capabilities, and lead the way in reclaiming your own self-assuredness, positivity, and health. Consider the wide variety of benefits of these heated pads and come to know your own self again, encouraging a healthy metabolism and healthy body weight with the heightened mind-set that the heat and healing stones offer. Don’t delay making your body your own again. Pick up a heated healing stone mat today and experience the benefits for yourself. It’s a full body size mat for therapy of all areas of a human body. It is unique, as both sides are usable (reversible). Made of several pounds of real natural amethyst on one side and jade and tourmaline stones on other. Note: when you heat this mat, both sides have a heated surface at the same time. Soft and easy to fold or wrap around. However, it’s full size with stones on both sides, so it is heavy!